Je moet de Drift modus overal gebruiken, echt! Het beroep autojournalist (in dit geval Sam Sheehan van Autocar.co.uk), biedt vele voordelen, je ziet nog eens wat van de wereld en mag je in de meest fantastische auto’s rijden en er van alles mee uithalen zolang het maar ‘heel’ retour eigenaar komt. 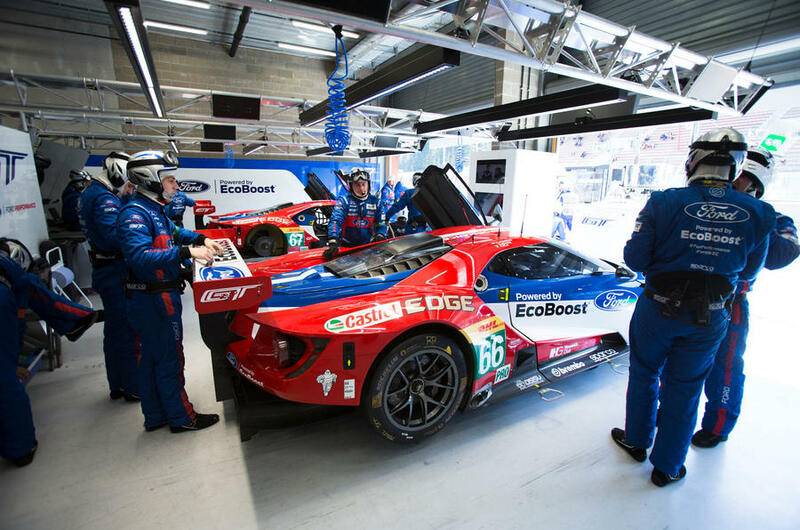 Na wat te zijn ‘bijgespijkerd’ door Ford GT 67 rijders Marino Franchitti en z’n collega Billy Johnson GT 66, een stevig rondje met de 2016 Focus RS mocht sturen over het circuit van Spa-Franchorchamps, tussen bekende namen zoals Ferrari’s 458 Italia en de Audi R8. 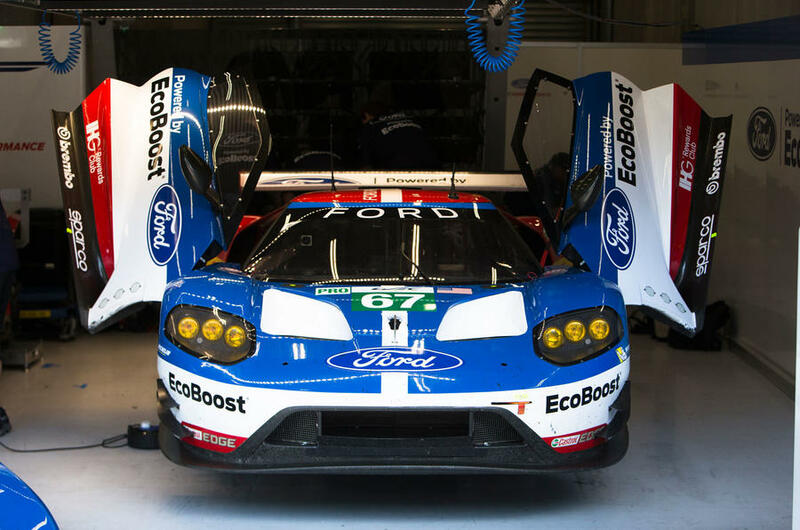 Ford GT 67 rijders Marino Franchitti en z’n collega Billy Johnson, rijder van de GT 66, die binnenkort met een Team van totaal 4 man sterk in hun Ford GT’s aan de start van ’24 uur race van Le Mans’ zullen verschijnen, hopende op een mooie overwinning. 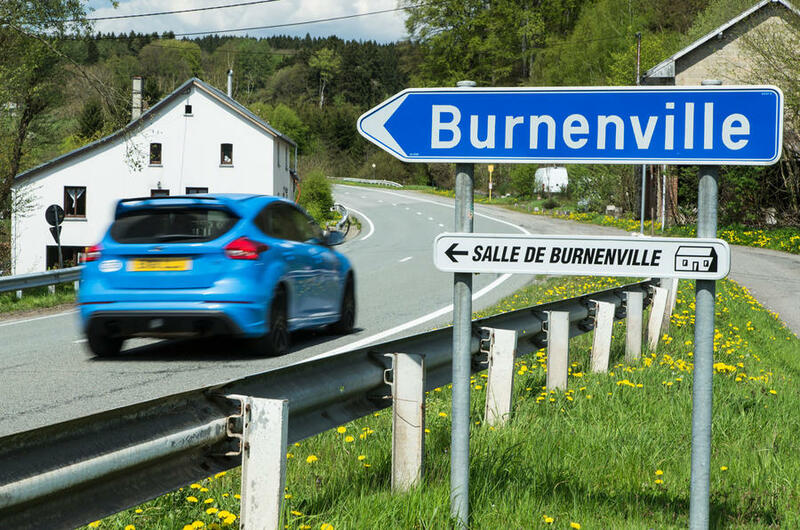 The new Ford Focus RS is the mega-hatch of the moment, but how will it cope with Belgium’s daunting Spa-Francorchamps? 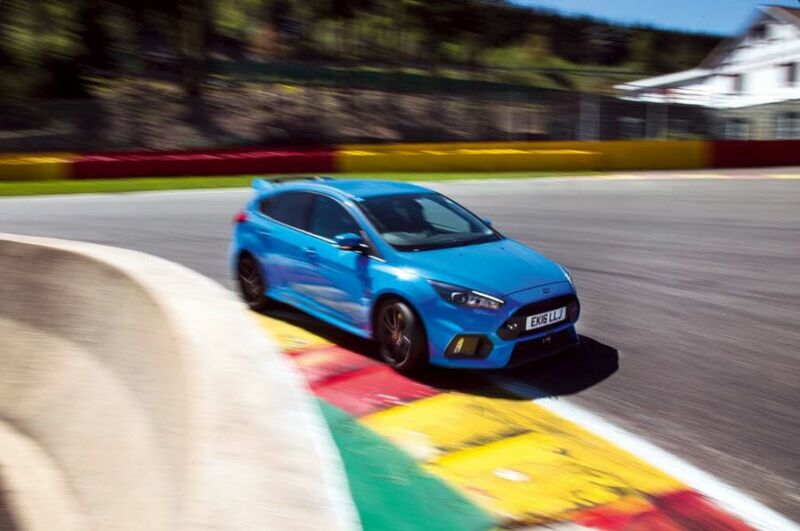 The Ford Focus RS shares the Spa-Francorchamps circuit with the likes of Ferrari’s 458 Italia and Audi’s R8. I daren’t take my eyes off the track ahead to look at the speedo, but the rate at which the posts to the right are flashing past confirms we’re travelling at one hundred and something. Easing off feels like a good idea at this point, but the car is capable of carrying more speed into the corner, so my right foot remains buried into the carpet, revs still rising. The flat yellow and red-striped kerb comes up fast on the left and the car charges over it, vibrations channelling through the steering column as the painted concrete flashes underneath. Things are happening fast. My eyes flick right and up the hill as I peel back off the throttle and tip the wheel right. The car’s nose darts towards the second apex, tyres squealing as the chassis loads up, then it’s hard on the throttle before the rear can rotate. The car squats and launches up the hill to the note of its muscular four-pot engine before the kerb on the right darts away and we power across the track towards and over the next kerb marking the left-hand edge of the track. It’s a struggle to keep the steering wheel pointed dead ahead, before the car settles and then fires down the Kemmel Straight. A little yelp of excitement escapes as the adrenalin sets in. That was Eau Rouge. If you haven’t guessed already, this is Spa-Francorchamps, home of the Belgian Grand Prix and one of the world’s most challenging race tracks, and, again if you haven’t already guessed, I’m driving a Ford Focus RS, our pick of the current crop of mega-hot hatchbacks and without doubt one of the cars of the moment. 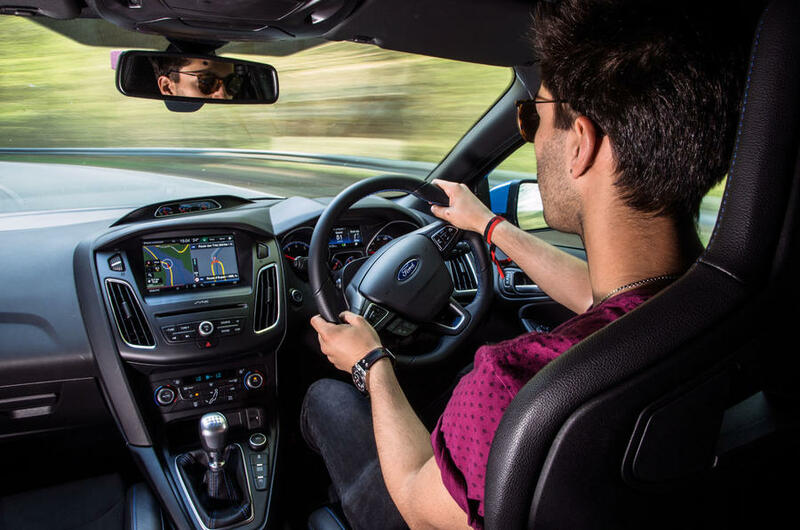 With its 345bhp turbocharged 2.3-litre four-cylinder engine, the Ford is seriously potent, while an innovative four-wheel drive system, co-developed by GKN Driveline, makes it feel as agile as a sports car. Yet it starts at just £31,000. 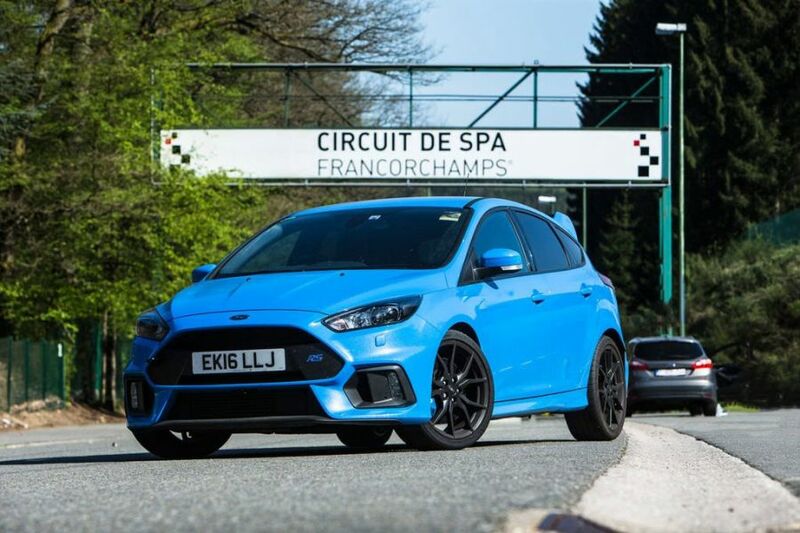 Bringing the Focus RS and the Spa circuit together was an easy decision, and the idea was sweetened by the fact that Ford would be competing in the 6 Hours of Spa World Endurance Championship round on the very same weekend. It also opened a new window of opportunity for us. 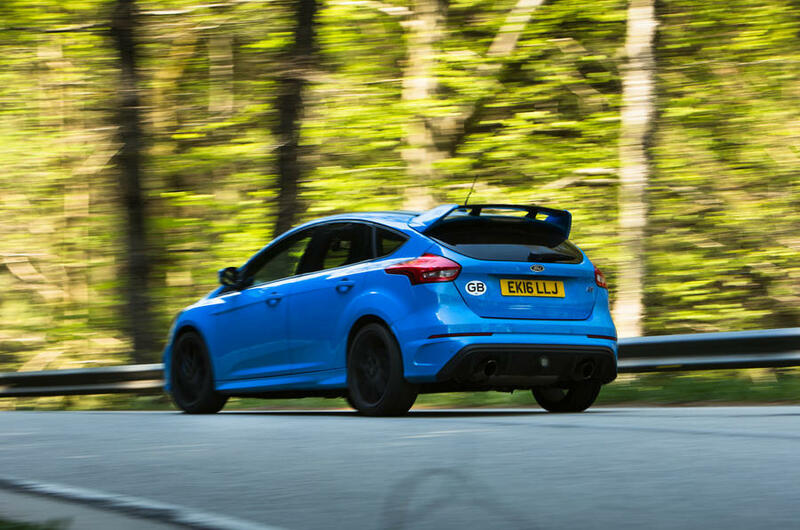 Ford’s factory racing drivers have all had a go in a Focus RS – one even helped to develop it – and after their Friday practice for the WEC round they would have intimate knowledge of how to drive Spa. Who better to ask for some track tips? While that would doubtless be fun, I explain that I’ll be running with other cars on a public track day, so a full Ken Block-style drift lap might be a bit anti-social. He agrees. 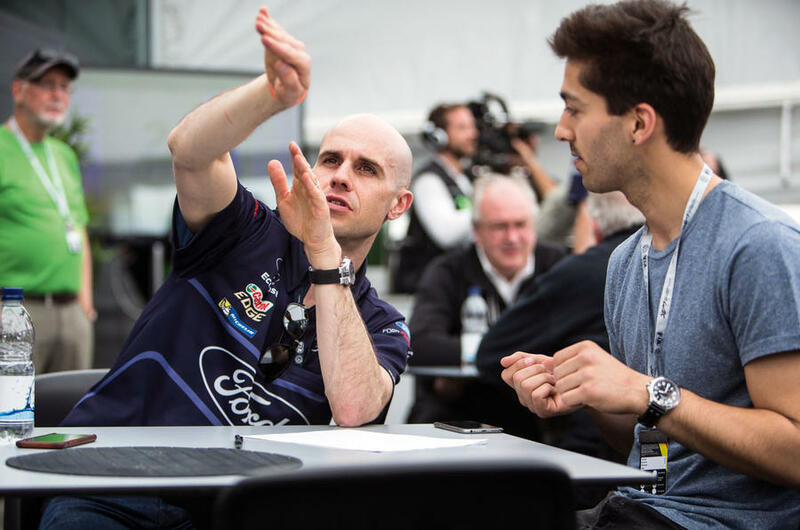 Franchitti starts with some advice for turn one, the famous La Source hairpin. “The main thing is the exit, because the speed you have there you’re going to carry all the way down the hill,” he says. Next, for the entry of Eau Rouge, comes the advice to be as close to the wall on the right as possible. 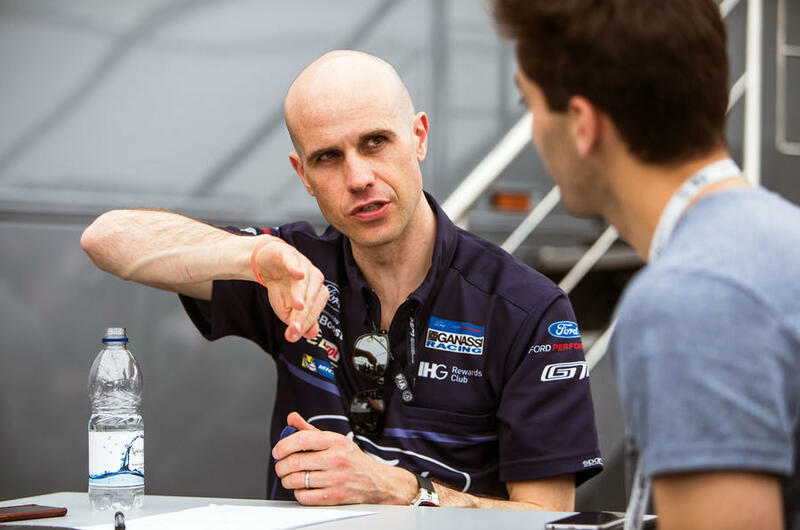 In his racing car, Franchitti is still flat out at this point, but he concedes that in the 1547kg Focus RS I will have to scrub off some speed. Franchitti talks through the whole lap. 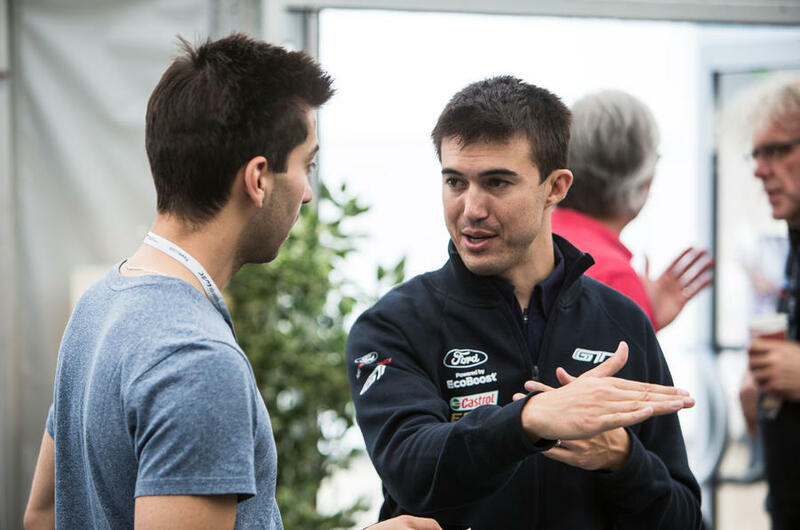 I nod and smile politely at his suggestions for braking points but secretly begin to doubt how much speed it will actually be possible to carry around the circuit in an overblown five-door hatchback. As Autocar snapper Luc Lacey and I leave the circuit that afternoon, I feel more knowledgeable but also slightly confused as to whether, come Sunday’s track day, the aim should be for a clean and fast lap or a wild and sideways one. The next day is race day. Endurance racing can at times offer little spectacle, with big gaps between each car and little wheel-towheel action, but this 6 Hours of Spa doesn’t disappoint. There’s plenty of on-track drama and the GT class in particular is fantastic to watch up close, with the likes of Aston Martin V8 Vantages, Ferrari 488 GTEs and the Ford GTs launching over kerbs to straight-line corners. Note to self: make full use of the kerbs tomorrow. Sunday, our day on track, starts well, with sunshine and 25deg C ambient temperatures. We couldn’t have asked for better weather, and it should ensure that there’s plenty of grip out on circuit, but it only takes the sight of shattered glass on the outside of Raidillon to remind us of how quickly things can go wrong. We didn’t come all the way here to cruise around, though, so, ignoring the pressure to do the Ford justice, I head out on track for the first session. 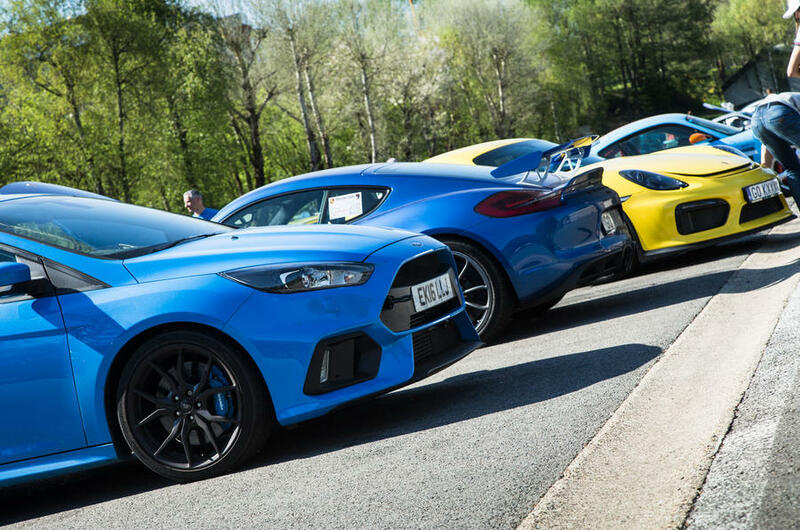 We’re joined by plenty of exotic metal, including a 997 Porsche 911 GT3 RS, a Ferrari 458 Italia, an Audi R8 and two Porsche Cayman GT4s – all cars that should wipe the floor with the Focus RS. But they don’t. Just two laps into the first stint, it’s becoming clear that the RS is one of the easiest cars to throw about on track. Most surprisingly, only the fastest of supercars can pull away from the Focus along the Kemmel Straight, while our car is so composed on the way into corners that it can be chucked at an apex while confidently holding the brake, in doing so making back any ground lost elsewhere to the more potent and significantly more expensive cars. 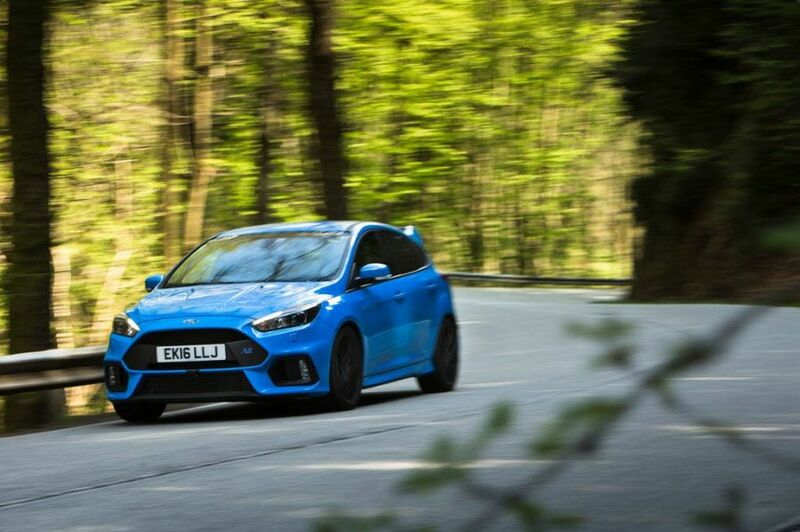 The RS excels through Eau Rouge, where it can carry immense speed into and through the corner without fear of a massive oversteer moment. The car inspires confidence and encourages you to push, and the engine pulls strongly enough to enable throttle-adjustable cornering. 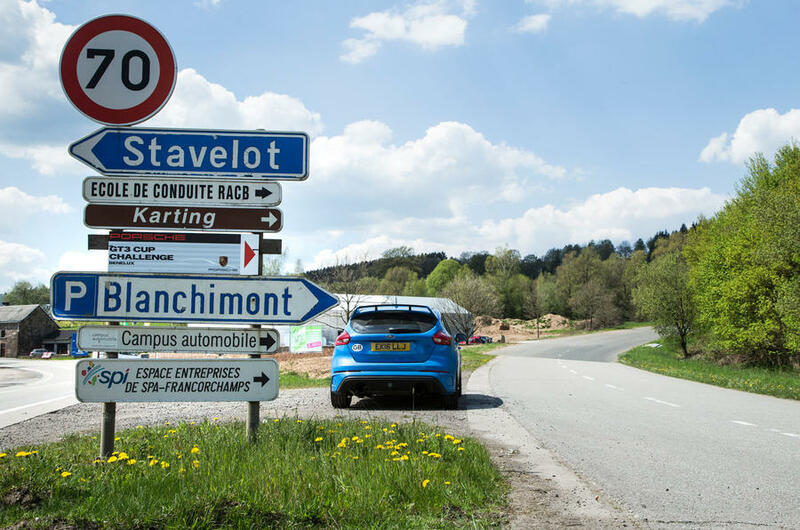 Such is the accessibility of the Ford’s performance that I’m able to soak up just how special it is to drive around the Spa-Francorchamps circuit. Michael Schumacher, Mika Häkkinen and Ayrton Senna have all punched above their weight here, and now, as we slither through Eau Rouge in pursuit of the Cayman GT4 up ahead, the Focus RS is, too.